Well, I said it would be worn as a scarf and here it is! Despite my frustrations with this project, I could not be happier with the end product. The pattern is very clear and well-written and I would certainly recommend it. I found Berroco’s Ultra Alpaca Fine delightful to work with. The yarn is smooth, soft and shiny and it comes in wonderfully saturated colors. 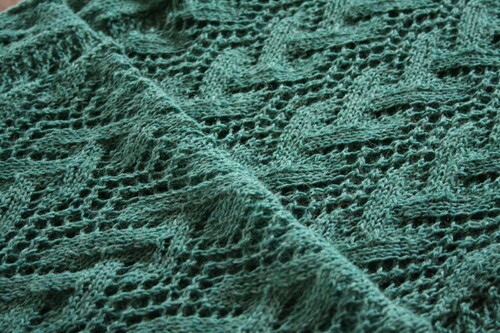 Furthermore, it is relatively inexpensive for the yardage ($8.75 for 440 yards). 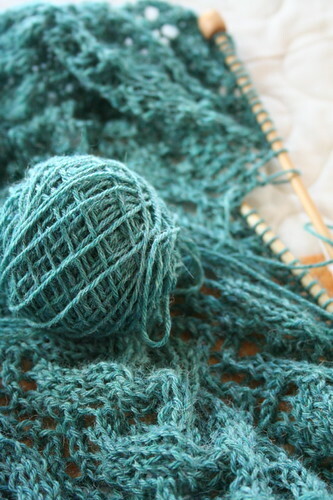 I fully intend to use the worsted weight Ultra Alpaca for a sweater in the coming months. One drawback of the project was that the knitted on edging required more yarn and took longer to complete than the main body of the stole. 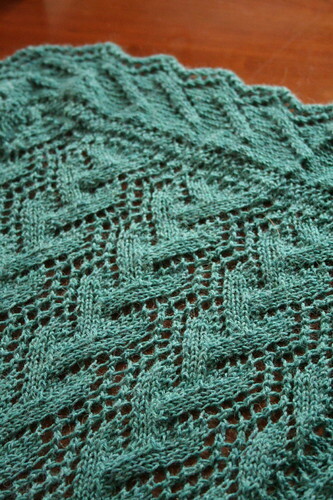 I doubt I will ever again sign up for knitted on edging. Still, I admit it was probably worth the trouble. 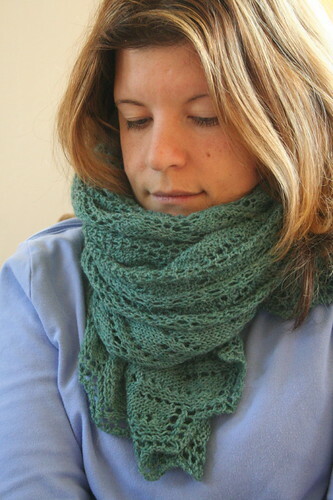 I will need to be careful how I wear this, however; already, I’ve managed to snag a few yarn-overs (without any damage). This probably cannot become my every day scarf but it will see plenty of use. It’s not bad for an unintended stash buster, is it? Several weeks ago, I wrote about an afghan I finished for my husband’s grandmother, Laura Belle, who died last fall. I told you about her knitting but I probably should have started with her quilting. After all, Laura Belle only threw herself into knitting and crochet to keep her hands in shape once she moved into an apartment and gave up quilting. After she died, my father-in-law gave me several boxes of her crafting supplies. 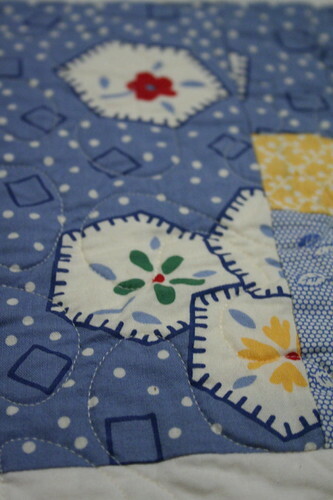 In them, I found a book I treasure more than anything else: her quilting records. Although she certainly made more in her life, Laura Belle began this log at the age of 60. The record book spans nearly thirty years of avid quilting and includes works she sold as well as ones she gave to family and friends. 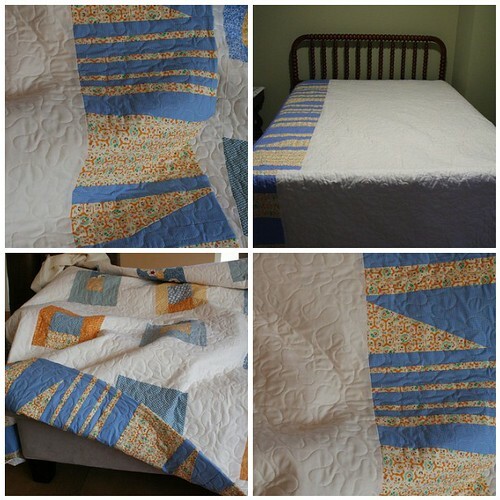 In some years, she turned out almost one quilt per month – all, of course, by hand. 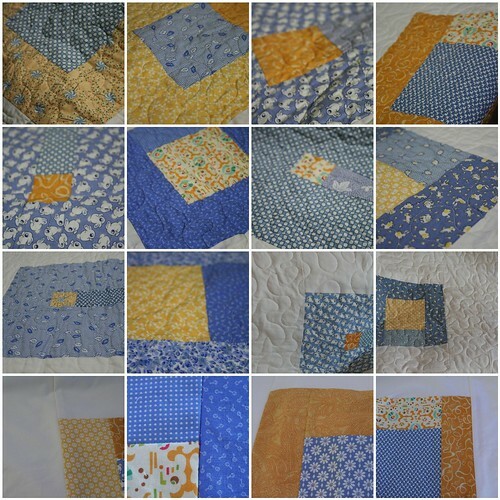 Each entry identifies the name of the pattern she used, the number of quilts she made with the pattern, the recipient, and the year she completed the work. 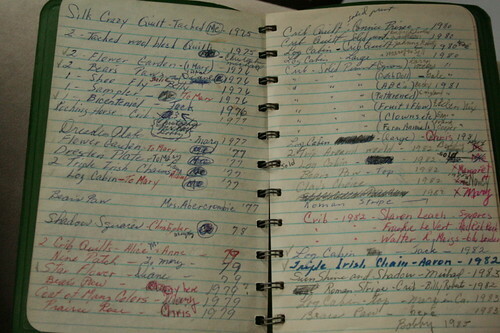 In all, 113 quilts, crib-size to king-size, recorded on a mere five pages of notebook paper. It amazes me to see what amounts to a life’s work of quilting represented in such a small amount of space. One thing that remains constant throughout the book is her evident generosity as a hand crafter. 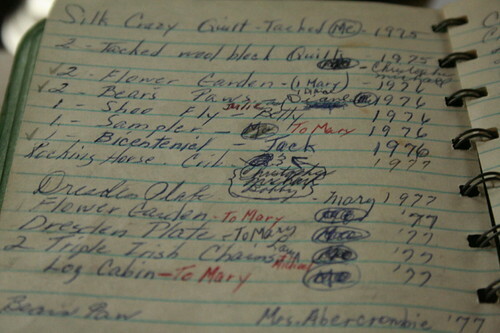 Many times, she listed a quilt as one she made for herself but then later crossed that out to indicate the name of the person to whom she gave the work. I smiled to myself as soon as I noticed the pattern. How many times do we do this as knitters? We all know the joy of sharing a handmade gift with someone who will appreciate it. 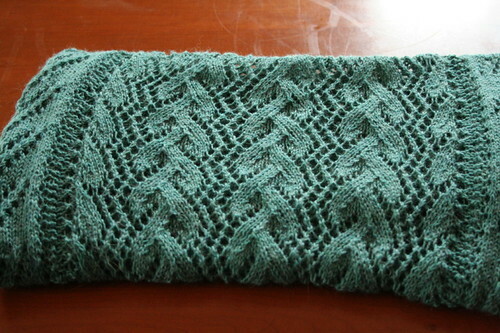 In many ways, I find knitting for an appreciative audience far more satisfying than knitting for myself. After all, I could always make myself that pair of socks, couldn’t I? Lately, I have been thinking a lot about Laura Belle and her quilts since I have been working on two gift quilts of my own this year. I completed the first one earlier this week. This was a housewarming present for a man known for his collection of really ugly ties. When I saw this fabric at a sidewalk sale this summer, I knew I had to try to use ugly tie-like fabrics. My goal was to pair mismatched fabrics to yield a pretty quilt, regardless of how loud or peculiar the individual prints were. I am quite pleased with the result! For the backing, I collected remnants from two of the many prints and sewed them together at random to form a stripe to run the length of the quilt. Because a quilt of this size would never fit on my little sewing machine, I sent this to my local fabric store to be machine quilted. With time, I grew more and more amazed by the enormity of Laura Belle’s five pages of records. This project took me five months to complete, although I sewed a seam or two here and there when I found a few moments of free time. Selfishly, I wish I could still show her my work. At the very least, I think she would laugh about the inspiration for this one! 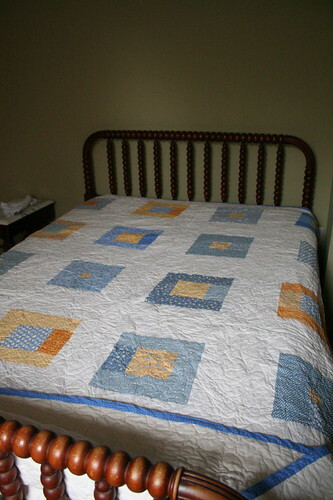 Regardless, I hope my quilt will provide as much joy to its new owner as Laura Belle’s quilts offer me and Aaron. 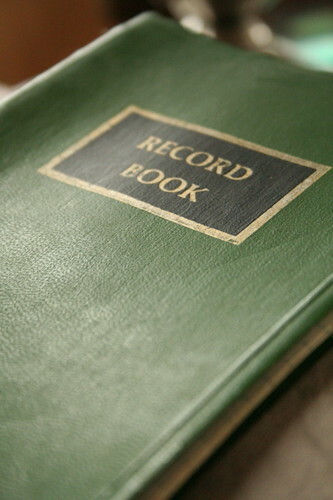 Perhaps it is time for me to start a record book of my own, short and paltry though it will assuredly be! 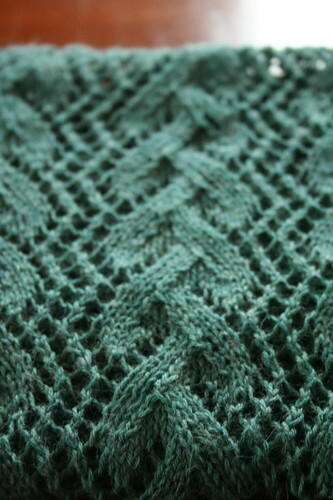 As I suspected last week, I will most certainly run out of yarn for my Print O’ the Wave stole. 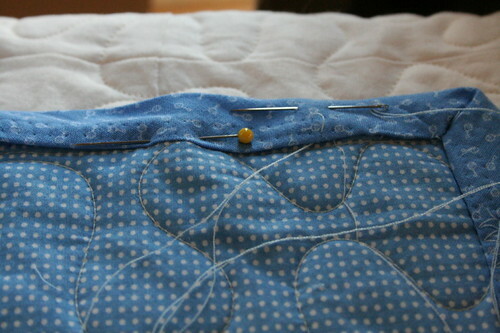 Furthermore, the zigzag stitch I used to close the binding on my current quilt failed miserably. Does it matter? I think not! I voted against Republicans today. And in support of public transit and the pro-science candidate for the Kansas State Board of Education. It felt great. 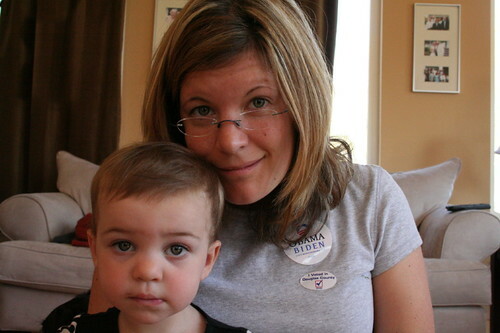 I hope your voting experience was as satisfying! Knitting content to return tomorrow!